In the United States, 'light tea' sounds like something on a label of bottled tea. 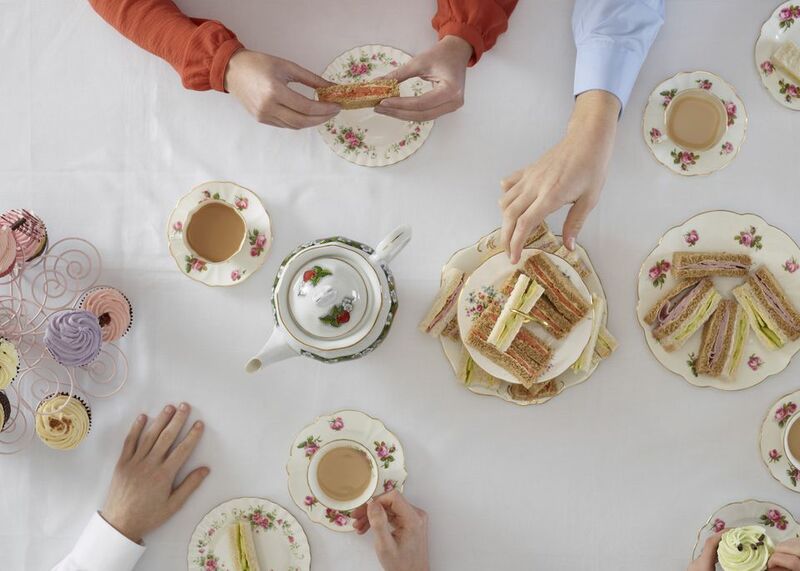 In England, 'light tea' refers to a type of afternoon tea meal. It is accented with sweet treats and features some of our favorite teas. True to its name, light tea is lighter than 'full tea' (which includes finger sandwiches and other savories) and is closer to a heavy snack than an actual meal. Light tea is a sweets-centric meal. You will find more cakes, scones, and sweet fruit treats than you might at other tea gatherings. Yet, light tea is also different than 'cream tea' where the food focus is on scones and cream. To make it more complicated, a 'strawberry tea' is a 'cream tea' with strawberries. Tea is also served at any of these 'tea' meals and it remains the centerpiece. The foods are accents and used to name and further define the gathering. When planning a light tea, a hostess will pair teas with a variety of sweets. British sweets tend to be less sweet than Americans may be used to. Quite often, the baked good is semi-savory or buttery flavor with a jelly or fruit spread to sweeten it up. Scones - A staple for any afternoon tea, you might choose fruit scones, chocolate scones, or any of the sweeter scones for a light tea. Sponge Cakes - A great variety may be found at tea and they can feature icing, whipped cream, lemon curd, almond paste, or jam. It's also common to find shaped cakes. For example, jelly rolls are rolled into spirals and Battenburg cakes (or window cakes) are cut into shapes that resemble windows with apricot jam between the "panes." Madeleines - These little treats are a cross between a cookie and a cake and the basic recipe has a buttery flavor. Madeleines can be made in other flavors as well, from chocolate to cinnamon, and even coconut. Cupcakes - In the U.K., these are often called 'fairy cakes' and vary greatly. Some can be quite sweet. 'Butterfly cakes' are cupcakes that include a bit of sweet filling and are topped with a butterfly-shaped piece of cake. We cannot forget the tea for a light tea and there are some favorites that work well with this line-up of sweet foods. Early Grey - The ultimate tea of any afternoon tea, you cannot go wrong with this blend and it is perfect with delicious goodies. Assam Black Tea - When served with milk and sugar to create a Milk Tea, Assam is a delightful choice for light tea. Chamomile Tisane - This 'herbal tea' is a popular choice because it is light and floral, perfect for pairing with those sweet foods. It's also caffeine-free. Mint Tisane - If chocolate or fruit is on the menu, then a mint herbal tea is the perfect companion.